LIFETIME ACCESS to all exercises and videos! This course will help you and your dog excel in Tulsa by breaking down the actual courses from last year’s National Agility Championship and creating practice exercises based on challenging sequences from those courses. provide you with video demonstrations of practice sequences that can be done with 7 jumps (or less) and a tunnel. help you execute and evaluate when to use the most common handling maneuvers seen in last year’s event: the rear cross, the front cross, 270, and wraps choices. challenge you with advanced sequences that may be used in this year’s event. Every week, beginning January 25th, we will release a course from the event. The event consists of a Jumpers with Weaves course, a Standard course, a Hybrid Course, a Challengers Course and a Finals Course. For each course, we have created 3-4 exercises based on a section of the course. Through video demonstrations and course analyses with the Coach’s Eye, we will advise you to handle the sequence in a variety of ways so you can decide which works best for you and your dog. There will also be an 8-12 obstacle challenge sequence using the same layout. The challenge sequences have been designed to help you prepare for more difficult challenges you might see at the event. Learn From a National Champion! This year, Sarah Baker will be contributing her expertise to help YOU prepare for this event. In 2015, Sarah won the 20″ class with her Border Collie Hops and the Preferred 20″ class with her labrador retriever Rice earning both the NAC and PNAC title at the same event. As part of the prep course, Sarah Baker will analyze her own runs with both dogs, sharing with you her handling choices and insights. You will also get to see her demo the Finals based exercises and challenge sequence. As an extra special bonus, Sarah has put together a bonus module with additional exercises aimed at preparing YOU to be the next National Champion! Thank you so much for making your 2015 NAC Prep Course available! As someone who was preparing to go to their first AKC Nationals, and who’s experience in competition has pretty much been limited to local weekend trials, I found the Bad Dog Agility Prep Course both eye-opening (in a good way), and beyond helpful. Your exercises, videos, and commentary, are so well presented; you are ‘Master Explainers’ and ‘Show and Tell Pros’. PS. By some miracle, we ended up with a 4th Place Cumulative Score in 12″ Preferred at the 2015 NAC (!!!) I highly doubt that would have happened had I not taken your prep course. So, Thank you , Thank you, Thank you! Don’t worry if you fall behind; you will have LIFETIME ACCESS to the material. This course does NOT include any personal video review. However, comments will be enabled on all articles for the first 5 months. Feel free to leave comments and ask questions. Great way to organize one’s NAC preparation. Exercise set-up was minimal and completion of the exercises helped build confidence in one’s team work.This course was better than a one day prep seminar as it covered more material and gave you time to practice different handling methods. The analysis of each course helped develop one’s skill in planning handling paths and alternatives for the 2014 NAC courses. This custom report shows a visual representation of your AKC agility history! 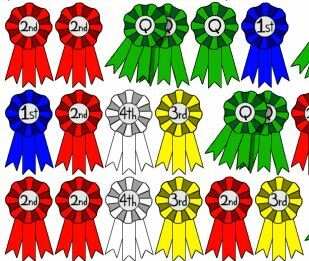 Show off your ‘ribbons’ in consolidated report showing every qualifying run with your amazing canine teammate. You may request this report for any current or previous dog you have owned. Click here to view a sample report. Q: Do I need to be going to the AKC National Agility Championship to take this course? A: No. While we designed the course with the AKC NAC competitor in mind, it will be open to everyone. A: Each exercise (including the 8-12 obstacle “challenge”) will use no more than 7 jumps and a tunnel. A: Most exercises will fit in an area of 50′ x 60′. 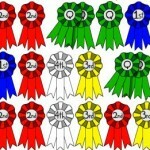 Q: When will I receive my personalized virtual ribbon wall & competition analysis? A: Your virtual ribbon wall & competition analysis will be delivered by email by March 1, 2016. Q: Who do I contact if I’m having trouble registering? If you’re not thrilled with our course, just let us know during the first 14 days and we will give you a full refund, no questions asked. Are You Attending the AKC National Agility Championship? If you are attending the 2016 AKC National Agility Championship, we would like to offer you 10% off the course. We hope to be a part of your success at this year’s event! Use coupon code “nac” (or “nacsplit” for the split payment). Click to Visit the Bad Dog Agility Academy and Register Today! Remember, registration closes and classes begin on January 25th. We look forward to continuing to help you develop as a trainer and a competitor.